One of the best pieces of culinary advice I've ever received was this: always sip something hot when eating chocolate, because the hot liquid magnifies the flavor of the chocolate in the mouth. And indeed it does! 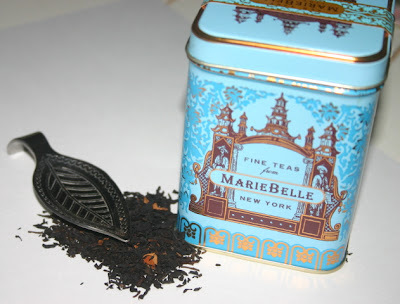 Last night I was having one of the new dark chocolate Snickers bars (yum), and with it I had a cup of Marie Belle's Dark Obsession Chocolate Rose Tea (mariebelle.com). Now this was a great pairing, I must say. Aside from enjoying such a tasty chocolate treat, I also was pleased to find this tea is still quite good, even though I purchased it in the fall about two years ago, as best I can recall. Conventional wisdom says tea lasts only about a year, but I have to say most of the tea I've purchased stays fresh much, much longer than that. At the World Tea Expo I heard one expert telling blenders they need to track each ingredient in the tea and start the freshness countdown from the moment the tea leaves are plucked. That may be good advice for anyone manufacturing tea, but for an amateur like myself, I have an easier method: just brew a cup, and if it still tastes good, drink up! 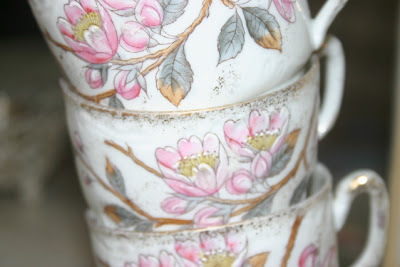 One of my favorite parts of planning a tea party is deciding what favors to give guests. 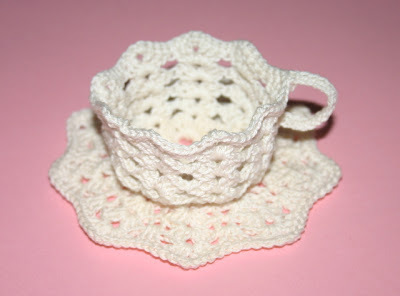 The other night, I was looking through my crafts bins for something else (of course) and came across this crocheted teacup. At one time I was turning out lots of these as tea party favors, but I guess once all my tea friends had one, I must've stopped making them. In anticipation of getting my life back this weekend, with time for reading and catching up on e-mail from friends, I have gathered a nice stack of books and magazines. One I'd been dying to get my hands on: Artful Blogging, the new magazine from the folks who do Somerset Studio. I love, love, love their magazines (especially Somerset Studio and the new Somerset Life), and I had a feeling this new blog-centered magazine would give me some great ideas for improving this blog. It already has. 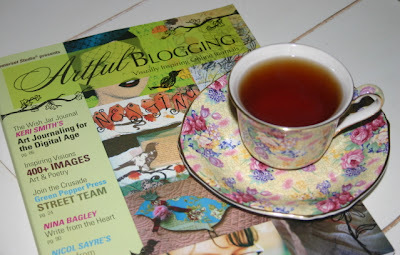 I know some fellow bloggers are readers of Tea With Friends, so I wanted to be sure to mention this magazine since it's so full of blogger inspiration. And one of my favorite stories mentions a "virtual tea party" staged by one blogger. We might just have to try that on this blog someday. 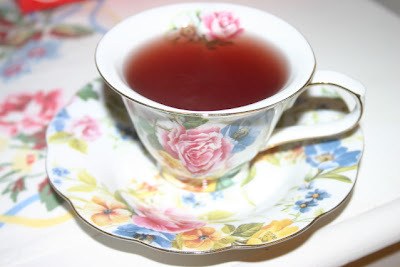 I'll host a "live" tea for friends, post pictures on the web, and wherever you may be, you can have a small or large tea party of your own and post the pics. But for today, I am just going to be catching my breath a little, no doubt strengthened by cups and cups of tea. 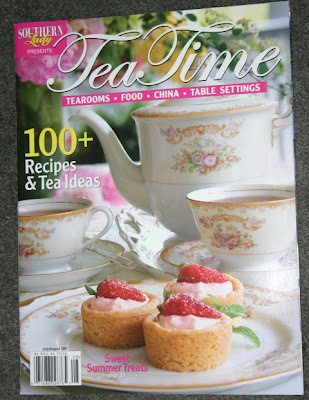 If you're interested in tea and tea accessories, then you may already be familiar with Tea Time magazine. This pretty glossy debuted in 2003, and I'm happy I discovered this early on and was able to collect every issue. The magazine began as a quarterly but has since gone to bi-monthly publication, happy news for those of us who can't get enough of the eye candy inside. There are articles on tea party ideas, tea etiquette, perhaps some pieces on tea history and tea rooms, and there are always lots of pictures of shiny new tea things. Tea Time is also an excellent source of recipes for tea sandwiches and teatime treats. I've made their white chocolate macadamia nut balls (from Spring 2004) numerous times, and there's a cheese olive ball recipe from a Christmas issue that is also a staple when I need a nice, quick savory treat. I'm sure I'm romanticizing the cups and saucers in my collection, but I just love inventing stories about where they all came from and what their lives might have been like before they landed at my home. Over the weekend, I had to blink to make sure I wasn't misreading the price on this stack of teacups and saucers at an area antique mall: $4 for all of them. We're talking $1 per set, or 50 cents per piece. 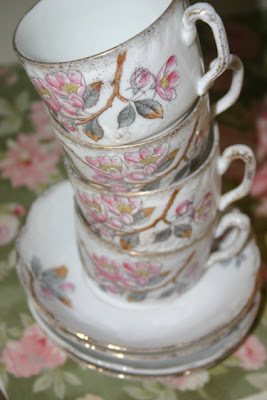 I wondered (as I made a beeline for the register) how the seller could afford to rent space in an antique mall and then sell vintage teacups for $1 per set. So I had to adopt these poor little cups and saucers and bring them home with me. In honor of this magnificent find, I used one of the sets for my favorite tea, Emperor's Bride, which can only be drunk from a worthy cup. Today I'm paying full price for my Revolution Tea, which I can't really complain about. 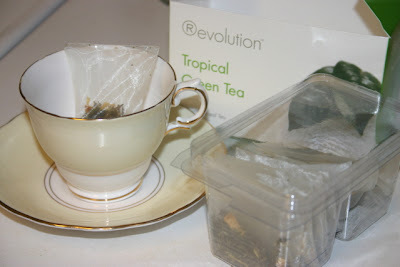 I was surprised when I recently tried this Tropical Green Tea and saw the silken bags are now tagless and in a clear plastic container, which I rather like. The ingredients in this delicious tea are "Young Hyson and Dragonwell Teas, Orange Peel, Peppermint Leaf, Jasmine Flowers, Lemon Verbena, Marigold Flowers, Blue Malva Flowers and Pineapple Flavor." 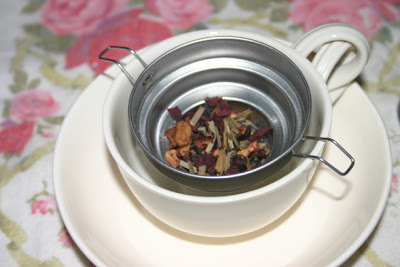 This is a great cup of tea to enjoy on a summer afternoon. It began, innocently enough, with some lip gloss. Lately I've become intrigued with backstamps and hallmarks on china, pottery and silver. 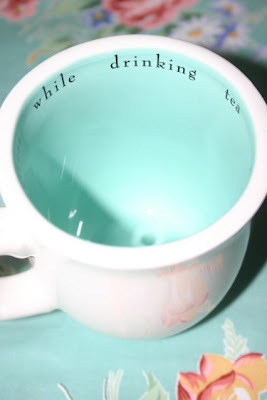 But what about when there IS no mark on your teacup? Well, experts say the absence of a mark indicates age. This is because when the McKinley Tariff Act was passed in 1890, imports to the U.S. were required to be stamped with the country of origin. 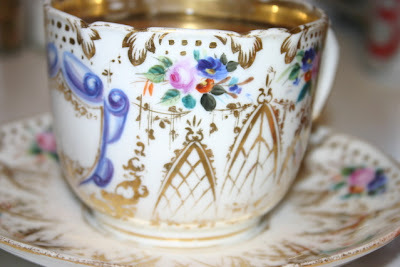 This fancy set, which I found at an antique mall, is on the large side (the cup is 3 inches tall, 3-1/2 inches in diameter, the saucer is 6-1/2 inches in diameter), and I really like the highly gilded design. There is no backstamp on either piece, but the shape and size match those of some old German pieces I have which feature lush pink roses. The shield on the side of this cup would have been the perfect spot for a monogram, but there is none. Was that a mistake? Is it an unfinished piece? Simply the way this cup was made? 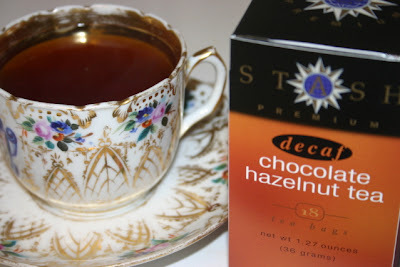 All I know is, my new Stash Chocolate Hazelnut Tea tastes even richer than usual when sipped from this delicious set. One of my antique store finds last weekend was this side-clasping tea infuser, the back of which is marked "W. Germany." There are no other marks, so I don't know who made this piece, but I found it interesting because of the mark and because it opens from the side. 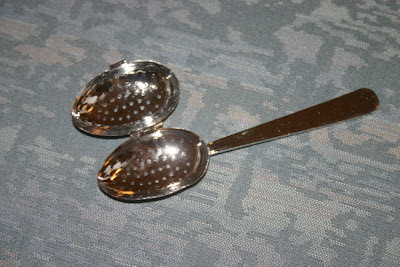 Most of the teaspoon style infusers I've seen feature a spring mechanism that causes the two halves of the spoon to spring open, clamshell-style. I tried this one out and it didn't work as perfectly as I'd like, because there was a little "air" at the top of the closed spoon where some of the tea leaves slipped out. Still, for $3, this was an interesting piece to add to an always-growing collection of tea accoutrements. It's been a rather hectic week at work, so one of the things I'm looking forward to when my ever-racing mind settles down a bit is this: having a little fun with some creative tea-themed art projects I've had brewing (or should I say steeping?) for a while. I want to play around with rubber-stamping some tea notecards, tea party invitations and bookmarks, and I want to turn one of those miniature black and white composition books into a dolled-up notebook dedicated to keeping tea-related notes. 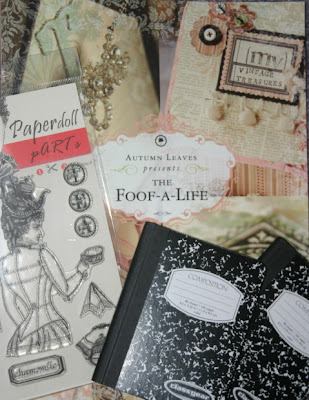 I recently got a great new papercrafts idea book, "The Foof-A-Life," which contains some Shabby Chic, altered art, collage-y type projects, and it has inspired me to finally use some rubber stamps I've been saving for a special occasion. These (at left in the picture) are from the Mad Tea Party Collection by Catherine Moore (they're at characterconstructions.com), and I love the whimsical nature of these designs. All the good health news about tea, and green tea in particular, has made me a believer, so I've been trying to drink a cup or two of green tea every day in addition to whatever other teas I'm drinking. Dr. Ron Sebold presented tons of compelling information about tea and health in his remarks at the World Tea Expo, and I particularly tuned in when he noted that "in rats, tea seems to help them learn," a fact he shared with his college-age daughter just before exam time! In an Iowa Women's Health Study he quoted, a study of some 31,000 women, it was found that drinking three or more cups of tea a day reduced the risk of developing rheumatoid arthritis by 61 percent. Since I quilt and do all kinds of needlework and crafts with my hands, avoiding rheumatoid arthritis would certainly be a good thing. 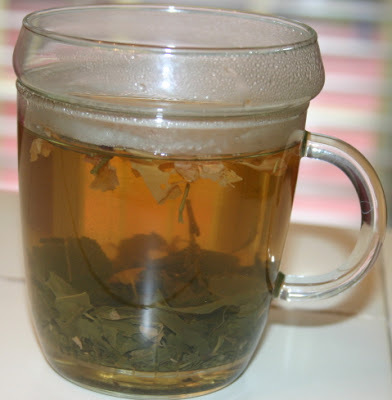 Tea's effects on preventing stroke and lowering blood pressure are also documented, and Sebold noted that while some studies are too small to be conclusive, he personally would tell a family member with HIV to drink more green tea. 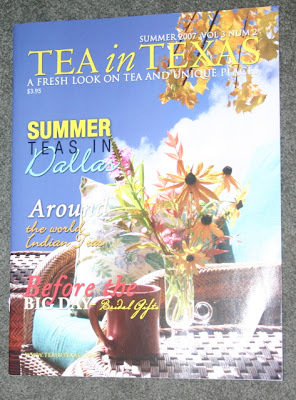 I'd heard of Tea in Texas magazine before the World Tea Expo but had never seen a copy until then, and since receiving the Summer 2007 issue I've enjoyed reading about the tea goings-on in Texas. In fact, since my brother-in-law is a native Texan, I may have to hand this magazine over to my sister since she visits the Lone Star State periodically. While somewhat slim (40 pages), this magazine is a full-size, glossy color publication, and I'm impressed there are enough tearooms and tea businesses in Texas to support it. The tea calendar alone tells me that tea is big in Texas: local events include an iced tea contest, a tea exhibit at the Barbara Bush Library, a tea fundraiser and a tea conference. There is an article on taking tea in Dallas, a page of tips on sprucing up your iced tea, and an article on Indian teas. The magazine appears to be well-supported with advertising, and if I lived in Texas I would have to subscribe because of all the tea-related information. (As it is, I don't really want to torture myself by reading about events I can't go to!) But if you're a tea-loving Texan, you may want to take a look at this publication. A year's subscription is $12 (four quarterly issues), and you can find more info at teaintexas.com. This is the teacup that almost got away. One Saturday last month, a girlfriend and I went on a long overdue shopping day and happened upon this antique mall in Decatur named Kudzu, only because I'd taken a wrong turn trying to find my way back home. 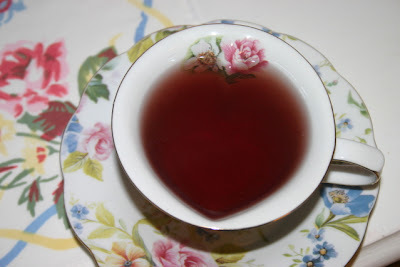 I found this adorable teacup with a heart-shaped interior, and even though it wasn't that expensive, I thought I could probably find it cheaper elsewhere. Turns out I couldn't. I Googled, I trolled eBay, but the closest I came was a plain white version of this set, which simply wouldn't do now that I knew a floral set existed. So over the weekend, when I had to go back to Atlanta anyway, I made a brief sidetrip back to the antique mall, back to the booth, back to the shelf ... and at first I didn't see it! (You antiquers know that feeling I'm talking about!) But lo and behold, it was on the shelf below, and I learned my lesson: if you see that one-of-a-kind piece and know you won't be able to live without it, save yourself some trouble (and gasoline), and go ahead and get it! Like a lot of tea drinkers, I'll bet, I am on a quest for the perfect tea infuser. I really prefer to drink loose leaf tea whenever possible, and I don't like to have any stray bits of leaf floating around in my cup. So far I've found that only a very fine mesh strainer and those paper T-sacs work perfectly, and still I get hoodwinked into trying the occasional new infuser gadget. 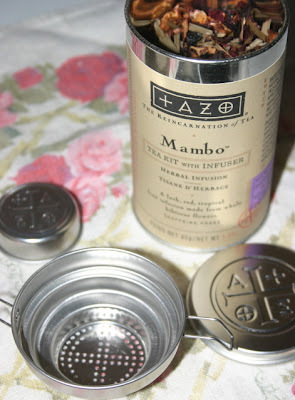 And so it was that I was lured by the cute packaging for Tazo Tea's Mambo herbal infusion, "A lush, red, tropical fruit infusion made from whole hibiscus flowers," which has a metal tea infuser built into the cap. But always willing to give something new a try, I spooned some loose tea into the cup and waited for the water to boil so I could steep my tea. Soon, the five minutes was up. And the result? Well, I can't say I was terribly disappointed because I was skeptical the thing would work anyway. The bad news is, I had to strain the tea through a "real" infuser, which wasted my time. 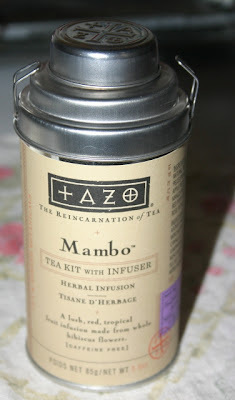 (Work on that, Tazo folks, would you?) The good news is, the tea tasted pretty good, and since it's caffeine free that will come in handy for bedtime drinking. The REALLY good news, though, is that since I had to strain the tea into a new cup, I got to use the most adorable teacup I've seen in many moons. I'll share it tomorrow, Lord willing! 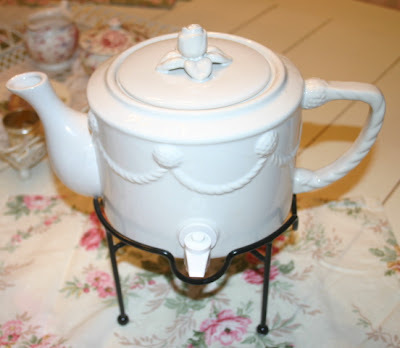 I decided not to spend this rainy Saturday morning sitting at home, so I went shopping and it turned into a bit of a tea-themed shopping day with a particularly wonderful find: a giant teapot with a spigot! I never knew such a thing existed! 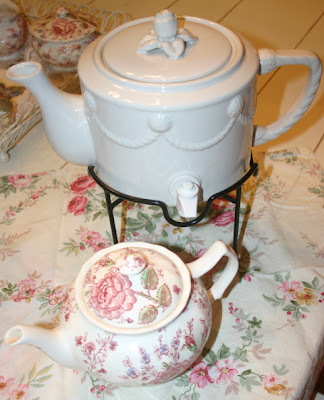 This teapot holds 12 cups of tea, and I'm showing it both on its own and with a normal-sized Johnson Brothers Rose Chintz teapot to give you some idea how large this is (13-1/2 inches from spout to handle x 8 inches tall). It would, of course, be better if the teapot were a) vintage b) decorated with pink roses c) made in England and d) possessing a white rather than black metal base -- something I intend to remedy with spray paint -- but for sheer usefulness, I can't think of much more to improve my tea serving abilities. With a 12-cup capacity, this pot can sit on the table with one of those cute little teapot warmers underneath and I won't have to refill it for quite a while. I tried it out and it worked beautifully without spilling so much as a drop. This was on clearance at T.J. Maxx for $12, and since I had a gift certificate it was actually "free" for me, so as I told my husband, "I got it for negative $12." Add this to the embroidered napkins I got at the new antique store in town yesterday, the vintage teapot tablecloth I got on eBay a while back, and clearly, it's time to start planning my next tea! I continue to be amazed at the number of new tea-related products that are out there whose manufacturers are leaving us to find out about them on our own. 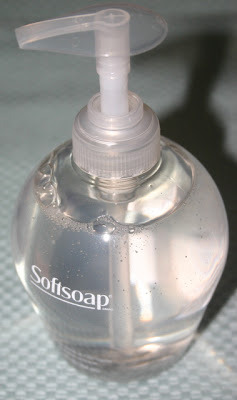 I just purchased my second bottle of Softsoap with White Tea & Ginger, an especially yummy scented liquid soap that contains "camellia sinensis leaf oil," according to the ingredient listing. I had not heard about this product anywhere, simply came upon it by happy accident at my local grocery store, where it was on sale for $2.99 this week. Part of my enjoyment is no doubt from the psychological factor of it containing tea, but the great scent and cute bottle design are nice as well. So there you have it: don't just look for tea in the tea section of the grocery store! When I drive down a highway and see a beautiful stretch of wildflowers, I always think of former first lady Lady Bird Johnson and her passion for beautification. Learning of her death yesterday, I reached for a newly-acquired book I haven't entirely read yet (but will! ), "Tea with Presidential Families" by Beulah Munshower Sommer and Pearl Dexter. 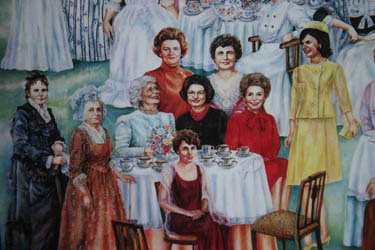 In the chapter on the Johnsons (see Lady Bird in a detail from the cover, above), I learned that as part of her social entertaining at the White House, Lady Bird gave many teas, hosting such groups as the National Council of Jewish Women, the Internal Revenue Service wives, the Committee for the Preservation of the White House, the International Congress of Archivists, and Girl Guides and Girl Scouts. She also had tea with Alice Roosevelt Longworth several times. Also according to the book, Lady Bird told of "an amusing incident when she walked into her husband's bedroom and found Richard Nixon sitting talking to Lyndon, who was stretched out in his pajamas, drinking tea." In her diary, Lady Bird wrote, "How many things are launched under the name of a tea!" RIP, Lady Bird Johnson. Bottled teas are all the rage, and I certainly understand why. They're convenient, they're an alternative to carbonated beverages, and tea lovers know they're often a healthy choice as well. So when I found some bottled tea for 50 cents at the local Big Lots store yesterday, I had to buy some. (I'd read online about someone finding great teabags at their Big Lots in another city. While I didn't find any teabags that interested me, I was surprised at the number of choices of bottled tea.) I bought the Ito En Tea Apple flavor, and it was delicious, with both the black tea and the natural apple flavor distinct. But alas, this one has 17 grams of sugar! If they made this sugar-free and kept it at 50 cents, I'd buy it by the boatload. Another tea I tried recently is diet Snapple Lime Green Tea. If you'll permit me a bit of a digression, I have to say I am somewhat bothered by the name of the flavor. If you're a woman who likes color, you know that "lime green" has been a popular color in recent years. So is "lime green" tea referring to the color of the tea? No, they mean lime-flavored green tea. (Yes, I know, I'm a grammar geek and think about such things too much, but I had to settle this in my head before I could enjoy my lime (flavored) green tea.) My first sip was heavy on the grassy taste of green tea, but the lime flavor came out as I drank more. I'd probably buy this again, and at 80 cents it's a pretty well-priced treat. 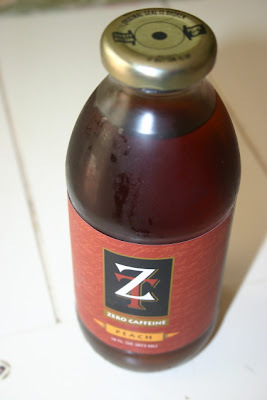 Finally, at the tea expo a few weeks ago I tried a delicious new bottled tea, ZT, made from South African rooibos tea. I tried the sweetened peach flavor (sweetened with sucralose) and liked it a lot. This one is the most expensive of the teas (it reails at $1.89 for 16 ounces), but I'd probably pay that if it were, say, in a place like Starbucks. Anyone want to comment on any bottled teas YOU have enjoyed? Several years ago I attended a trade show for the coffee and tea trades (very heavy on the coffee, light on the tea), and that's where I first became familiar with Fresh Cup magazine, which calls itself "The Voice of the Specialty Beverage Industry." I read it for about a year, but since the annual subscription price is a bit expensive for a casual reader ($38), I did not renew. I received two recent issues at the tea expo, and here's what I found. 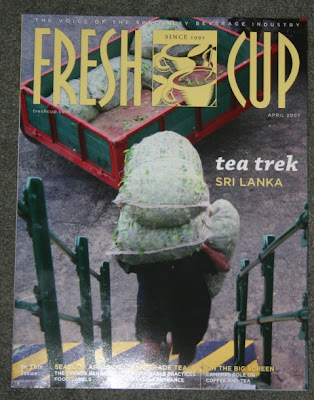 The April 2007 issue has features on fair trade tea and on the Sri Lanka tea market. In an article about coffee and tea in movies titled "On the Big Screen," I learned that a movie is coming later this year called "The Darjeeling Limited," in which three brothers visit India after their father dies. Natalie Portman and Owen Wilson will star. The May 2007 issue has an article on the history of Russian Tea and an article by James Norwood Pratt on 2007 trends in the U.S. tea market. Fresh Cup also publishes one tea-only publication, its annual Tea Almanac, which I have purchased a couple of times and found packed full of tea info. Fresh Cup seems to be about 75 percent coffee, 25 percent tea (at best), and the ads reflect this. There are ads for various coffee machines, coffee flavoring syrups, coffee roasters, and only the occasional tea ad, perhaps showing a mix for something like a tea smoothie. My recommendation is to read the tea articles as you can find them online (the entire magazine is not available online) at freshcup.com, and then to just order the Tea Almanac published in December. At the World Tea Expo a few weeks ago, Alda Ellis had run out of copies of her book, "Sentimental Living from the Porch," so I ordered one and had it mailed to me. As soon as I opened it the other night and saw all the wonderful photos and ideas, I knew this would be a book I will turn to again and again as I plan tea parties for friends and family throughout the year. Already, I've experimented with several ideas in the book. Alda likes to give friends treats of little bags of flavored sugar for sweetening tea. 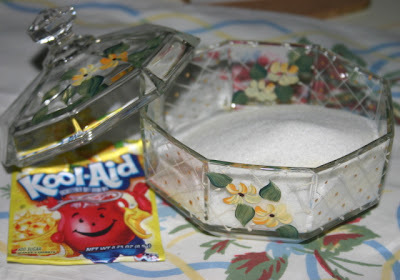 It's quite a simple recipe (one cup of sugar, one .23-ounce package of Kool-Aid), and I tried the lemon flavor and thought it was pretty good! 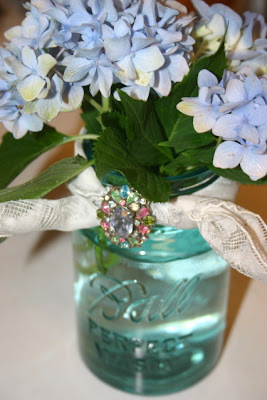 I also liked her idea of embellishing a vintage Mason jar, something that's extra "sentimental" to Alda because Mason is her maiden name and the name of one of her sons. She uses a handkerchief as a collar for the jar and accents it with a vintage clip earring. These are just the first two ideas I've used, but she has lots more I plan to try: stringing old beads to make candle lanterns with old Mason jars or sugar bowls, stitching up a quick quilt out of floral fabrics and buttons, etc. And one of the most amazing tips I got when she spoke at the tea expo: Did you know that all tea light candles FLOAT? I tried both a plastic one and metal one, and lo and behold, they float. The book is organized according to the seasons, and I can't wait to use it this fall and during the Christmas holidays. While at the beach last week, I discovered the so-so mugs in the condo were a great excuse to go in search of a new piece of teaware. 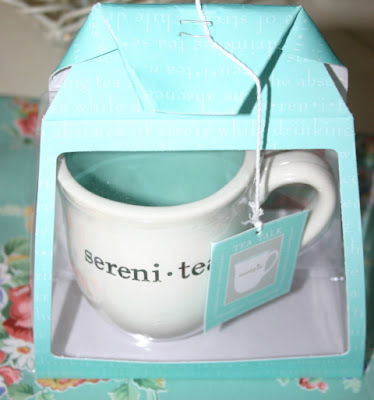 Hooch & Holly's in Seaside, Fla., one of the best stationery stores I've found recently, had the perfect thing: a Serenitea mug from the company Mudpie. 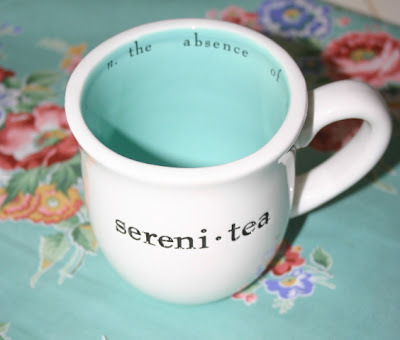 Around the top it gives the definition of the word Serenitea: "n. the absence of stress while drinking tea." Although the mug isn't my usual English-bone-china-with-roses preference, I thought the sentiment and color (that clear, sparkling blue-green that looks like the foam on waves rolling in from the ocean) made this the perfect choice for drinking tea at the beach. And whoever would've thought of making a package shaped like a teabag? Cute, huh! I think this will be a good way to kick off this Saturday morning of 7-7-07. Hope yours is serene as well! The cover shot is pretty, even though I'm not at all tempted by the $180 tea set with a frog on the teapot and handle-less cups. Harney seems to favor simplicity in its teawares, which is fine and probably suits a lot of people; they just aren't feminine enough for me. But fortunately I don't really go to the Harney catalog for teawares but tea itself, and the selections are always endless. On my wish list this issue: flowering teas, the Historic Royal Palaces line of loose leaf teas, and something I think is just wonderful, Harney's own line of 50-count boxes of teabags. These would be perfect for enjoying a quality cup of tea at the office. There are some new tea cosmetics I've never seen before, but they are part of a gift set and don't appear to be available individually. (Guess who's going to be googling for these shortly?) The catalog also shows a photo of the bottled tea they had at the World Tea Expo and says to check the website since they hope to offer it by mail in the near future. 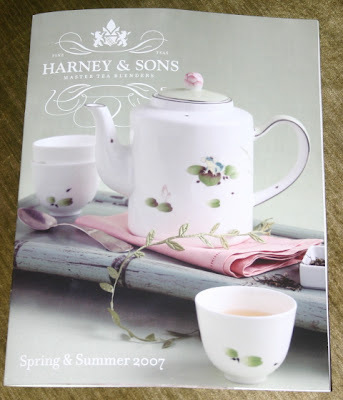 The website is also the place to get on the mailing list for this must-have tea catalog (harney.com). A few days ago I picked up these Green Tea Mints at a World Market store. (I'd seen these in some tea catalogs but had never ordered them.) I got the Delicate Pear flavor, and I like these a lot. 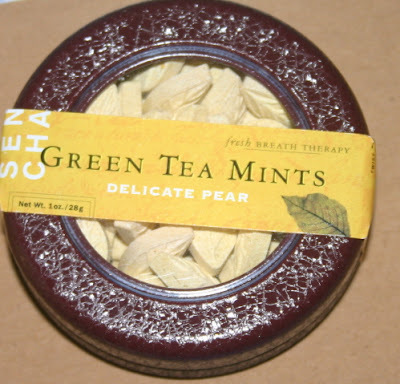 The mints are sugar-free and made with organic green tea, but the main thing is: They taste good! Also a plus: They're cute. The mints are shaped like little tea leaves, which I think is good design on somebody's part. The travel tin in which they're packaged (which I also like) says that 3 mints = 1 cup of green tea. Still, I prefer to drink my tea rather than munch it, so I think these will be a sometime treat rather than a replacement for my growing green tea habit. I learned from the company's website (senchanaturals.com) that these also come in Original and Lively Lemongrass flavors. Definitely worth a try if you come across them! What does a tea lover drink on the Fourth of July? 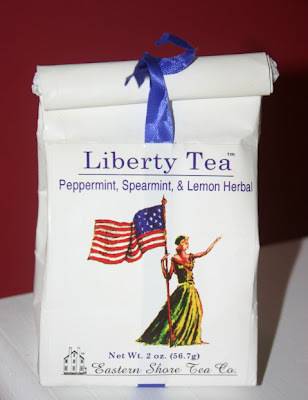 Why, Liberty Tea, of course! This tea was purchased for me at the White House gift shop by a friend, and here's the blurb from the back of the bag: "Our forebears, in forsaking the pleasures of China tea for the principles of liberty, needed a 'tea substitute.' New Jersey red rooted, sage and raspberry leaves were among the plants touted as 'equal to or better than' tea. But none by itself gave the same satisfaction. With a spirit and resolve, the Colonial dame looked to her larder, garden and fields to create an acceptable substitute. And she succeeded, from Maryland to Massachusetts, by using native plants and the herbs at her disposal. In tribute to, we again took up this challenging exercise in American ingenuity. Using five colonial herbs, the result is a complex and exciting herbal blend, with full body. We modestly think of it as a new American classic! No caffeine. Complements: liberate your imagination: a ripe peach slice, a few strawberries or raspberries, a citrus slice, rose petals, mint sprigs, honey." The ingredients in this blend (from the Eastern Shore Tea Co. in Maryland) include Raspberry leaves, Rosehips, Peppermint, Lemon verbena and/or Lemon Balm, Spearmint. Whatever tea you choose to sip today, I wish everyone a very blessed Fourth of July! I am not happy about having to write this, but I must retract my earlier, well-intentioned recommendation of this magazine. After subscribing in the summer but never receiving an issue, I have made several e-mail requests and phone calls regarding my subscription. No response. In October, I visited an Atlanta tea room and saw stacks of the Spring issue still sitting on the counter. If there was ever a Summer issue, I didn't see it on the web site. (Over the summer, I called their office and was told they ran out of copies but my Fall issue would be arriving soon.) The cover of a Fall issue is now posted on the web site (11/10/07), but I have not received one and TED has chosen not to reply to my several efforts seeking an explanation. I have since learned of other readers around the country who have not received their magazines either. Because of my bad experience with Tea Experience Digest, I want to make sure others don't make the mistake I did in subscribing. A couple of years ago, I began to see The Tea Experience Digest in tearooms around the Atlanta area. 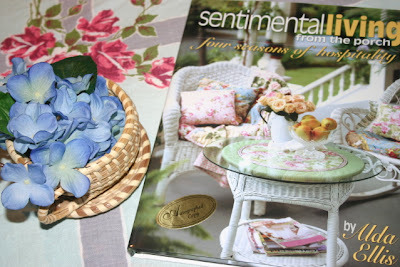 I liked that it was digest-sized (small enough to tuck in a purse), and that its quarterly issues featured listings of tearooms on a regional basis. Because I seemed to always get a copy for free at tearooms that were giving it away (the cover price is $3.95), I never actually purchased a subscription. Perhaps a year had gone by since I last saw a copy, so I was happy to take home the latest edition from the World Tea Expo this year, handed to me by the smiling, energetic editor herself. And I have to say, I am pleased with the direction she has taken her book. In the Spring 2007 issue I learned about tea events scheduled around the country, tea products which benefit breast cancer research (the editor's letter gave a heartfelt nod to friends and family with breast cancer), a tea trivia quiz, upcoming tea tours, chocolate flavored teas (I'd like one of each, please ...), new tea products (Dove has a Cucumber and Green Tea Body Bar? WHY aren't they advertising this product in the dozen women's magazines I read? 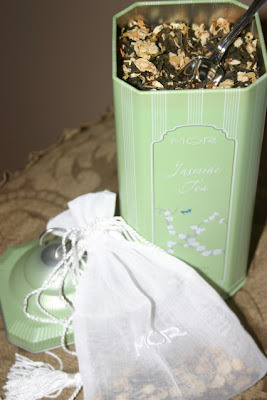 ), spas using tea, bath teas, and there's plenty more but that's enough to whet your appetite! This issue features tea rooms and retailers in the Northeast USA, and the back of the book includes the Tea Yellow Pages ("Largest Tea Yellow Pages in the World"). Interested? A four-issue subscription is $14, and you can find more info at teaexperience.com. 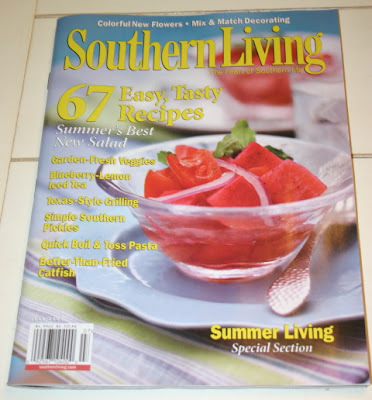 I've been catching up on reading the dozen or so magazines that came last week, and the new issue of Southern Living has quite a few recipes with tea this month. At the front of the book, there's a nice photo along with the recipe for Blueberry-Lemon Iced Tea, which uses a package of frozen blueberries and simple tea bags. At the back, there is an article titled "Unexpected Flavor" which promotes the use of tea in cooking. The recipes which use tea include Chai Tea Mini Biscuits, Orange-Scented Couscous with Moroccan Dressing, and Mint Tea Custard. 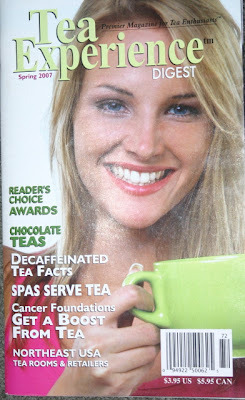 And another tea-related note ... this issue of SL also has an ad for a bottled tea, Lipton's PureLeaf White Tea. (The one pictured is Tangerine, but I don't know if other flavors are available.) Haven't heard of this before, but if I find one I'll have a sip and report in! And speaking of bottled teas, did anyone watching the Concert for Diana last night (I KNOW some of you were watching!) catch the humorous ad airing right after the show for Snapple's Earl Grey Tea? The folks at World Tea Expo said we'd be seeing more bottled teas, but I didn't realize I'd be seeing so many so soon. I just hope they're at my local Publix! Last week I had the chance to visit, once again, one of my very favorite "beach shops," Pickets in Seagrove Beach, Fla. I love going in a shop where it's quiet, not rowdy, and soft music is playing. This one features items any gardener would love, and the owner also stocks lovely tea towels, dishes, napkins and other goodies for the table. I got four pale, robin's egg blue placemats to match the new furniture on the deck back home, which has that particular shade of blue (and brown) on the upholstery of the cushions and umbrella. 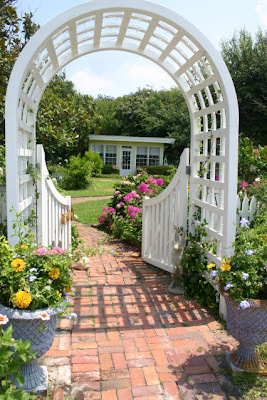 The first time I visited this shop, I remember the owner asking where I was from, and she actually knew of Newnan, and knew that it was the home of Liz Tedder and her wonderful gardens at Oak Grove. No wonder this lady has such a lovely place! 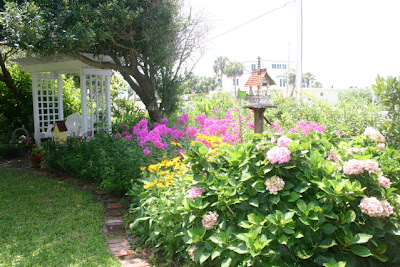 So if any reader is going to the beach for the Fourth, or anytime this summer, look for the pretty archway and the little yellow block building sitting back from the road. 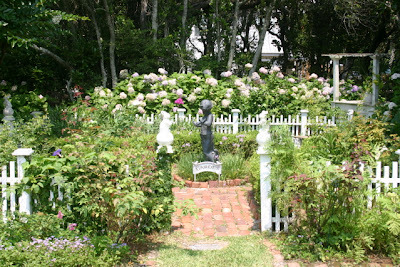 I think you'll be pleased to find this lush little garden at the beach.